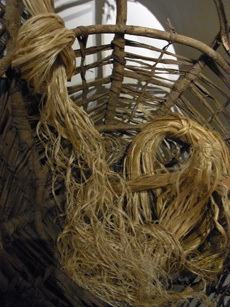 Hemp and ramie are two kinds of plant bast fibers. They are also known as asa in Japan. Asa was still in use when cotton started spreading throughout Japan. Hemp belongs to the mulberry family. It takes up to a year for the plant to mature. Hemp thread was considered sacred in old Japan. It was used for making garments worn by emperors for use at political events and festivities. 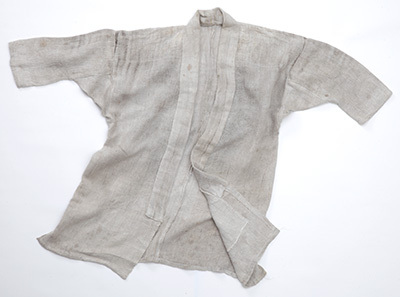 Simultaneously, hemp cloth was also used for making clothes worn by common people, feudal lords and warriors, as well as for everyday use, such as string for tying packages. 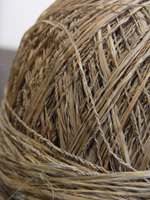 Hemp’s relative flexibility depends on the thickness of the thread and from its exposure to the sun. People’s knowledge of hemp’s broad utilitarian applications led to many ways of using different weights and grades of hemp threads in the creation of various everyday, utilitarian items. Regarding work clothing, when cotton was not available, the main concern for common people was to use a material that was warm and soft. Hemp cloth of the appropriate weight and sun exposure (sunlight produced a natural bleaching) was the solution. 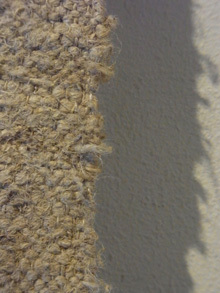 The more hemp cloth is sun bleached, the softer it becomes. This precious work garment went through this natural bleaching process and has become softer from continuous wear. 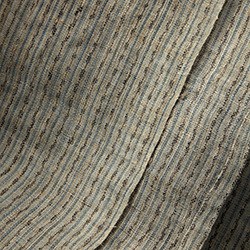 This is a stylish kimono which is woven skillfully with hemp threads. 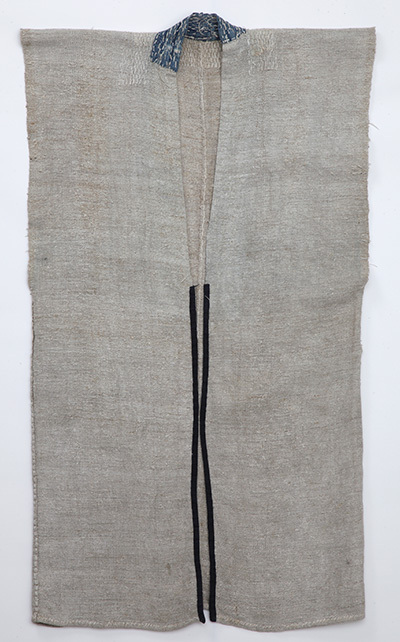 It is believed that the cloth called Takamiya-fu during the Edo period is the antecedent of modern Oumi- Jofu, which was woven in Shiga prefecture. Hemp cultivation was widespread in old Japan and hemp was a staple material. Creating thread from hemp is an incredibly complicated process. A great deal of waste is generated during the production. Hemp waste is called okuso. The “o” in the word okuso means “hemp” before it is processed into thread. “Kuso” means waste. Okuso was probably recycled in various ways. Nowadays, very few things are recognized as okuso clothes. Okuso is a short fiber. When the fiber is spun into thread, as cotton is, it would be used as weft. Common people were very grateful to have okuso weft, a thread that was soft and pliable enough to be woven tightly, which produced a cloth that provided warmth when cotton cloth was not available. 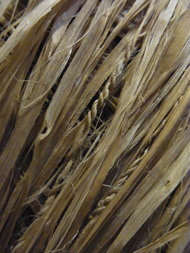 The use of okuso weft was found only in Fukui, Ishikawa and Niigata prefectures from the Meiji period (1868 - 1912) to the beginning of the modern Showa period (1926 - 1989). The method of making okuso cloth might have been forgotten were it not a small production that still continues today, as there were no written documents left behind.